This entry was posted in Epic 40k and tagged Epic 40k, Goffs, Space Orks. Bookmark the permalink. Thank you! Painting them really brought back why I like Epic 40k 2nd Edition – the visual spectacle of having these large companies move across the battlefield is a joy to behold. Excellent work mate, great to get all that detail in at 6mm!! Thanks! 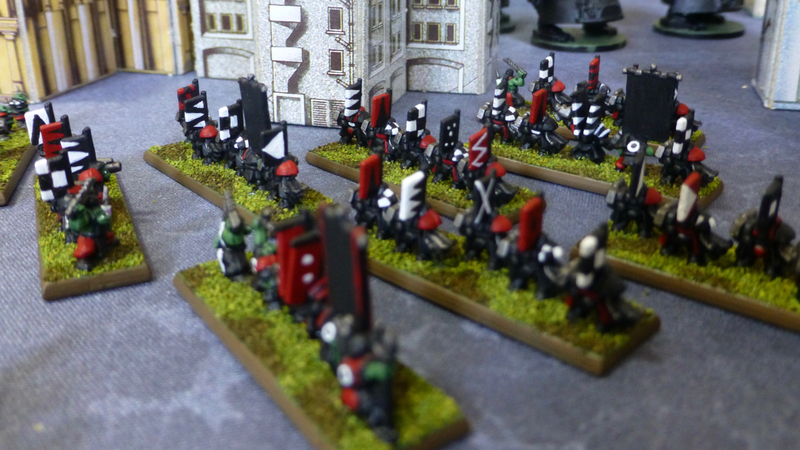 I increased the size of the chequers on the back banners and shoulder pads after the first few stands, but then it was quite straight forward. Cheers, it was beginning to feel like a drag but I really want to get two opposing full companies done before going up a scale again for a while. Although I’ve never gamed with GW minis, I was always impressed with Epic armies, and I think you’ve done a brilliant job with these! Really does take me back years seeing them! Love ’em! Thank you! It’s a great scale, allowing for anything from hordes of infantry to mighty titans. The game was very well supported at the time with new units and rules regularly published in White Dwarf, so I have a lot to draw on now to bring my armies back. Splendid job, you really brought the scale and the sculpts to life! Thanks, the Space Orks look really cool in this scale I find with their strong clan based colour schemes and iconography. 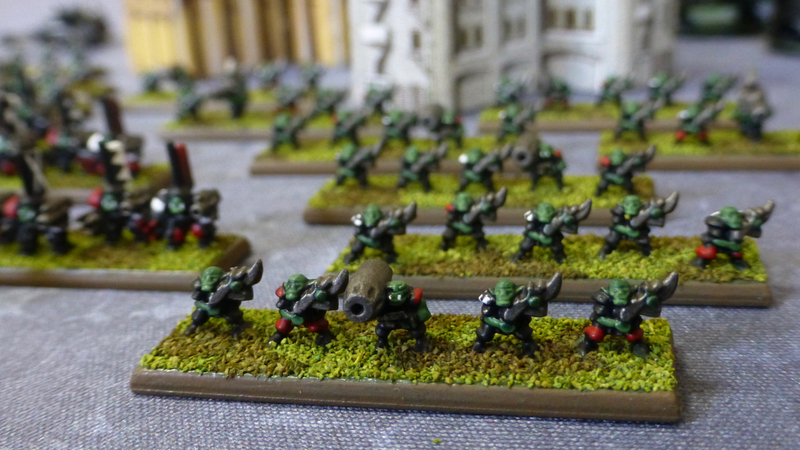 I might have to do a few test bases for all the other clans I am planning. Very impressive notwithstanding they are so small! Love the work you did here, an epic contribution to the hobby world! Glad you are enjoying them. 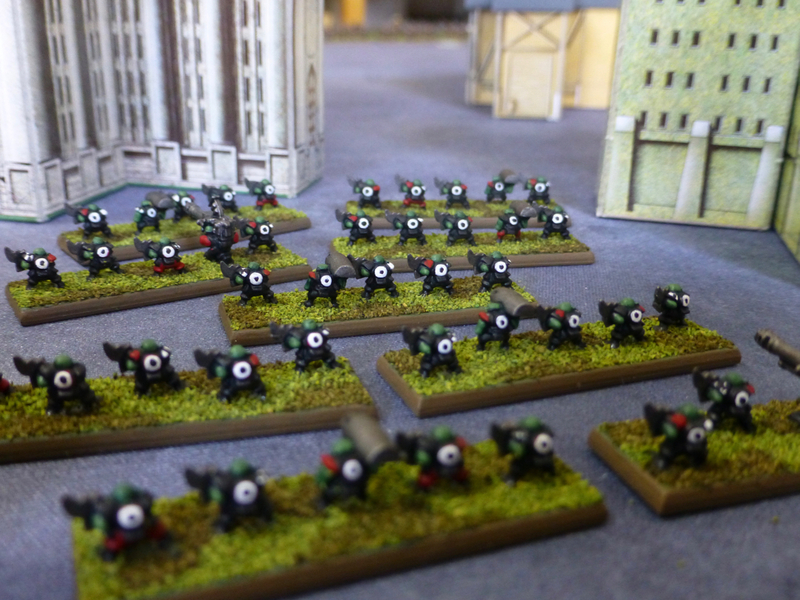 I am just running through a test battle to remind myself of the rules and tweak the forces a bit. 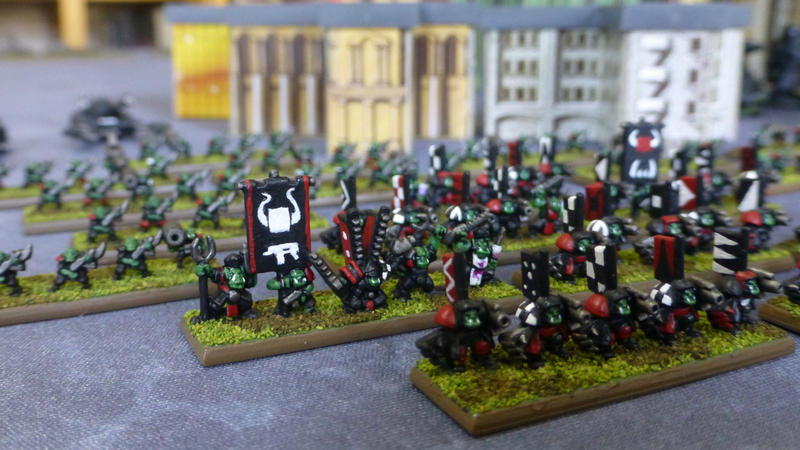 Very nice job on your Epic Goff ork boys! Thank you, the Goffs have a very rewarding colour scheme.